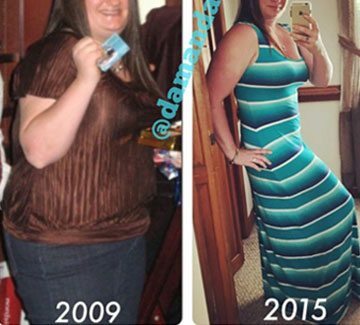 This is very hard for me to post…so hard it brings tears to my eyes every time I look at the before picture, and I’m embarrassed of it. This is my story of a girl who didn’t even realize she got so big until she saw the before picture tagged to her FaceBook after a company Christmas party. I got on the scale a few nights later and it said 230lbs!! I couldn’t believe I’d gained so much weight after having my first daughter in January 2009. I showed the picture to my husband and he couldn’t even believe I’d gained so much weight! So we got Wii Fit and started learning the basics of real exercise. When I was in High School I was very fit, active, and being lean came easy. I was in dance and gymnastics my whole life!! So being unhealthy, large, and out of shape was unbelievable and unreal for me! It was in June 2009 I decided to buy an elliptical and got on it for 30 mins everyday and started counting calories and eating clean. I lost 45lbs right away! Then after having my second daughter in 2013 I decided to join American Family Fitness! Taking classes, lifting weights, and working with a personal trainer who specializes in HIIT and guess what, it changed my life! So much so I’ve decided to become a personal trainer! Fitness and health is where my heart lye’s! Yes I know I have quite a bit to go but I’ve been through so much that I thought it was important to share my story, to inspire and to motivate just one person. My fit journey is far from over and I will continue to improve! Take it one day at a time! Progress is progress even if it is slow! I will be an AmFam member for life and hope to be a personal trainer there one day! I love the atmosphere and customer service you have provided and making me always feel welcome! I have been working with Michelle Haas (personal trainer) for the past 9 months which has increased my fitness level like I couldn’t have imagined! She is an amazing trainer!